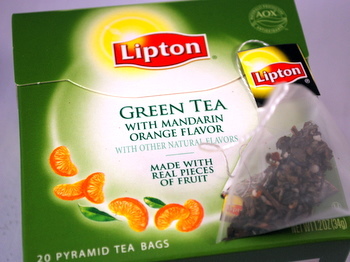 Lipton’s Green Tea with Mandarin Orange is not a new release, but the holidays really get me in the mood for citrusy flavors, so I couldn’t resist giving it a mention. This tea has a wonderful orange flavor to it, in fact, it is so orangy that you can’t really taste the flavor of the green tea base much at all. This may be a bad thing in some cases, but not here. The orange flavor is smooth and not too sweet on its own (if you add sugar to your tea, that’s a different story!). It doesn’t have the bitterness that is the result of overusing orange zest, and it also doesn’t taste artificial, even though the flavor is strong. I suppose that means there is something to be said for the use of “pieces of real fruit” in with the tea. I like this tea as a light, orange flavored drink. I think it would be a huge hit with anyone who wants to try out green tea but isn’t a fan of the grassy flavor that can accompany the tea sometimes. I also want to applaud Lipton on their packaging. Their pyramidal nylon tea bags are packed neatly into a small box that doesn’t compress the tea leaves or waste space with a box that is excessively large, like the TJ’s Cranberry Green Tea I tried recently.